TMS Europe manufactures portable calibration tube furnaces. They are designed for calibrating thermocouple temperature sensors and probes at temperatures between 400 and 1100°C. For calibrating temperature probes at lower temperatures we also offer a range of temperature metal block calibrators. 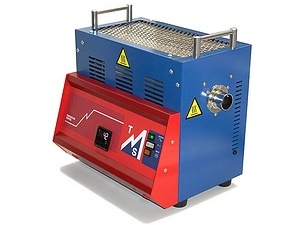 We also offer larger bench-top calibration furnaces. The TMS Thermal Cal 1 is portable horizontal tube furnace. It provides is a high stability heat source designed for the calibration of thermocouples, with a maximum operating temperature of 1100°C.